Home. Kids. Life. : What's In Your Pet's Dish? What's In Your Pet's Dish? I may have shrieked like a girl. May have. I tried to control it around my kids. You see....I found this lovely arachnid in my dog's water dish. Then I discovered it was still alive. Enter a girly scream here. A controlled girly scream with some wiggles and heebee geebees. I still shudder thinking of it. Ewwee. I had to show my kids that I was brave. So I went out and got the grill tongs. Cause they are the longest things in my house to keep that 8 armed thing away from me. Now don't get me wrong...I'll get up and close to a tarantula (like in this post), but this spider was not friendly. If they're outside my house, they're allowed to live. But if they are on or in my house, then that is their death sentence. I've had a couple of infected spider bites (and bee stings), so I have a rational fear of the things. Or maybe it's irrational? 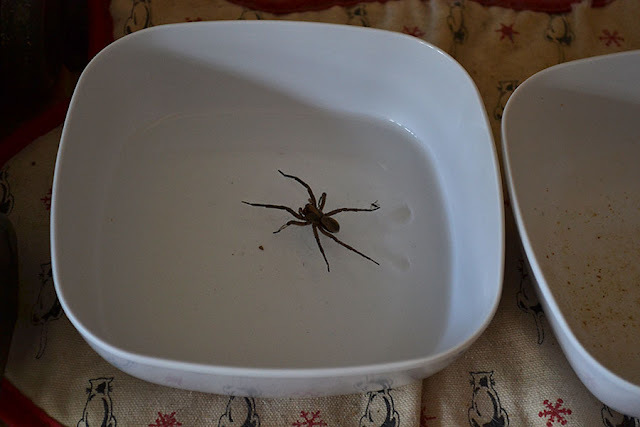 With a few subdue girly screams and some wiggling (on my part), I got that still alive spider in my tongs after a couple of tries and sentenced it to its punishment for entering my house and taking a swim in the dog bowl. My kids thought I was awesome! They were so impressed! But when I discovered another huge spider on our house next to the front door that same day, I commissioned Biker Boy to deal with it. I did email Biker Boy at work a picture of the spider in the dog bowl to prove what I did. Yep. Just the other day two Fed Ex guys dropped a box off at my front porch. Usually they drop the box, ring the bell, the dog starts yapping, and the guys are gone before I can even unlock the door. But this time I opened the door to find them standing on my doorstep and pointing at the front of my house. Yep, another huge ol' spider trying to enter my front door. They were pretty amazed at the size of it and Chewy had to tell them the story of how one was in the dog's water bowl. No wonder they usually drop the boxes and run. I left the spider for Biker Boy to deal with. Oh...and another one got squished in the door frame. I have no idea why they are trying to enter my house through the front door. Yuck! Maybe they are trying to catch the plethora of moths we have going on here. And now the cicadas are going like crazy too. This is the year for spiders, moths, and insects. Great. So tell me....what's the most interesting thing you've even found in your pet's dish? Or any dish for that matter. We're in end of the school year mode here....busy, busy, busy!